You may recognize the following collection, Venetian, from our 2018 Spring Summer Collection. If you’re new to this collection, I’ll give you a little background. 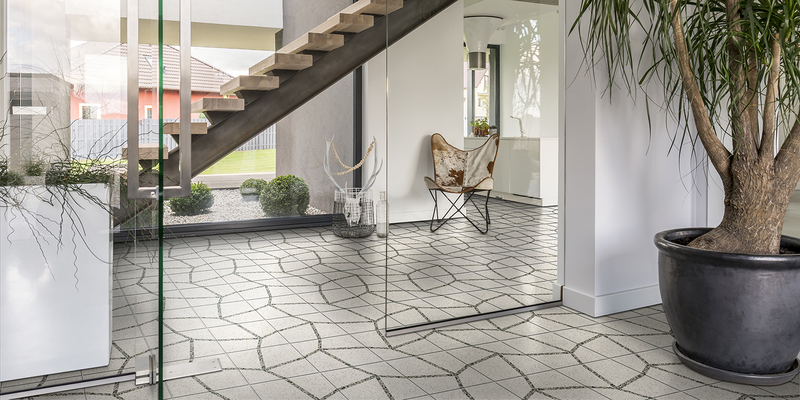 Venetian is a terrazzo aesthetic in a porcelain form that has been taken to the next level with interesting aggregate colors and unique geometric patterns. 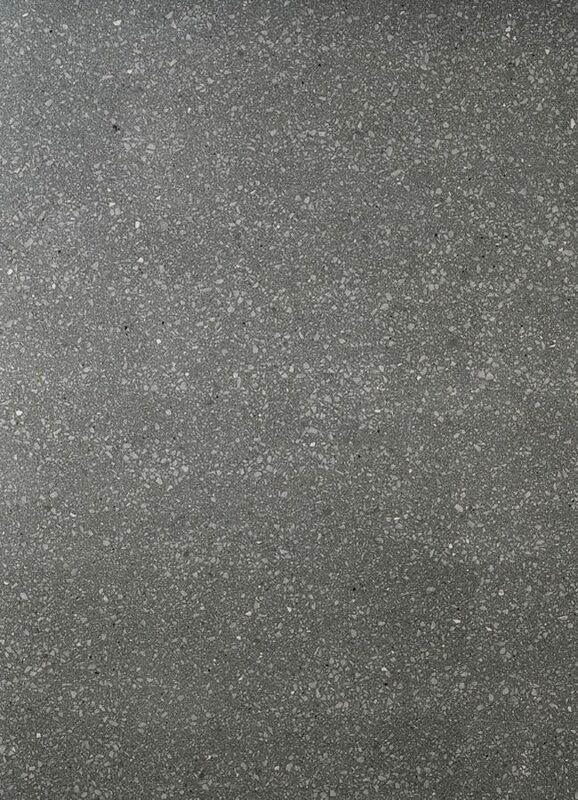 Terrazzo looks in porcelain tile are nothing new as far as trends are concerned. 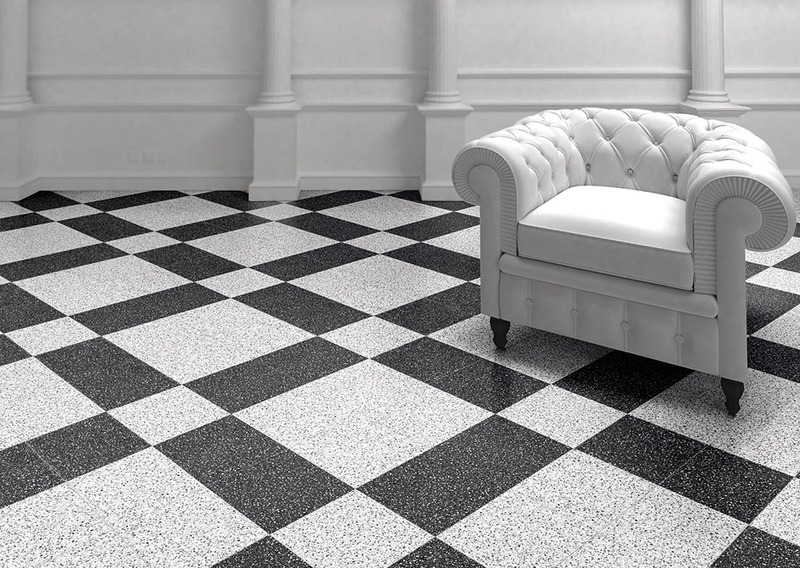 Years ago manufacturers developed the aesthetic, but it didn’t really catch on because the formats were small and didn’t capture the true essence of terrazzo. 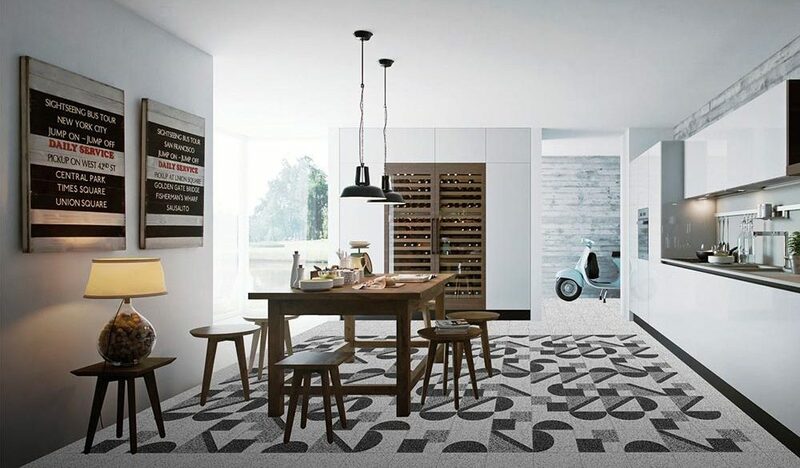 That’s changing now, as the format of porcelain is growing and so are advancements in the digital technology, manufacturers are diving into this aesthetic with traditional terrazzo looks (like Begosso), artistic interpretations (like Bricolage), and colorful aggregates and patterns (like Venetian). I believe this aesthetic is going to continue to evolve and who knows, maybe it will completely replace real terrazzo in commercial spaces. 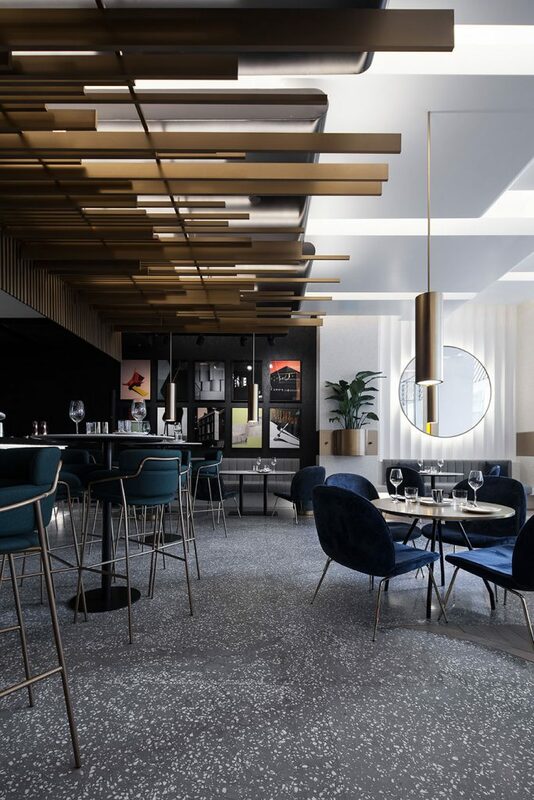 When I look at interiors, I was drawn to floors that display minimalist aesthetics like concrete, but now that I’m seeing more instances of terrazzo, it is becoming one of my favorite aesthetics. Take this installation from Coordination Asia, they “designed [Gaga Chef] to take diners on an elegant culinary journey, in keeping with the rhythms of day through to night, the space blends comfort and creativity with modernity and style to set a benchmark for the city.” The terrazzo gives this space a beautiful visual texture, just imagine if they decided to go with concrete, how different it would look. The terrazzo exudes the feeling of night with its deep tones. To me, the floor is a reflection of the sky and stars. Creative Materials’ Bricolage Black Micro has a very similar aesthetic to the terrazzo in Gaga Chef. It’s dark background and light aggregate give you that sense of night. 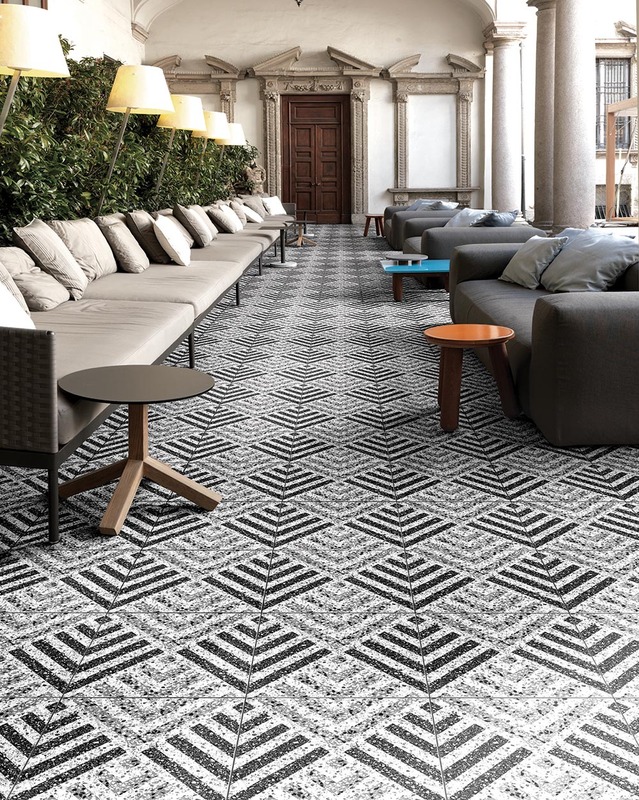 Venetian’s unique geometric and organic designs allow you to create interesting and intricate patterns within your designs. This is a good and bad thing; good in the sense that it will be a defining element, and bad in the sense that the possibilities are endless and rather time consuming. This is where Creative Materials’ Design Services can help. We can explore the various layout possibilities for you within a collection. You pick the pattern and we will compose multiple layout options for said pattern, along with generating installation layouts that will make it easy for your installer to lay. Venetian’s Green 01 is a great example, this organic pattern takes on a life of its own depending how its orientated. 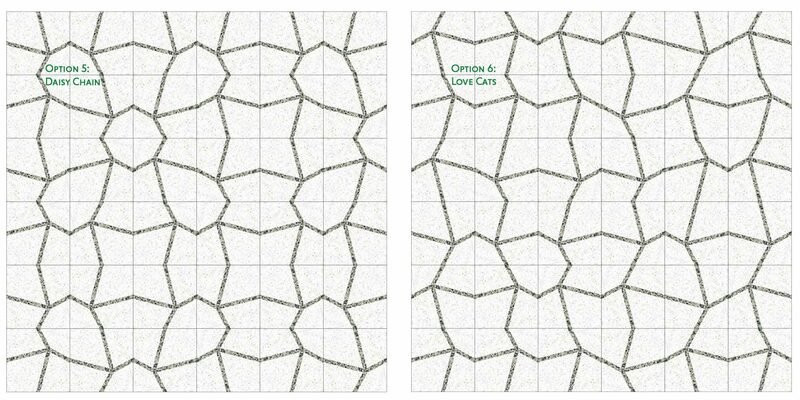 Below are 6 examples of different patterns that can be created with Green 01. 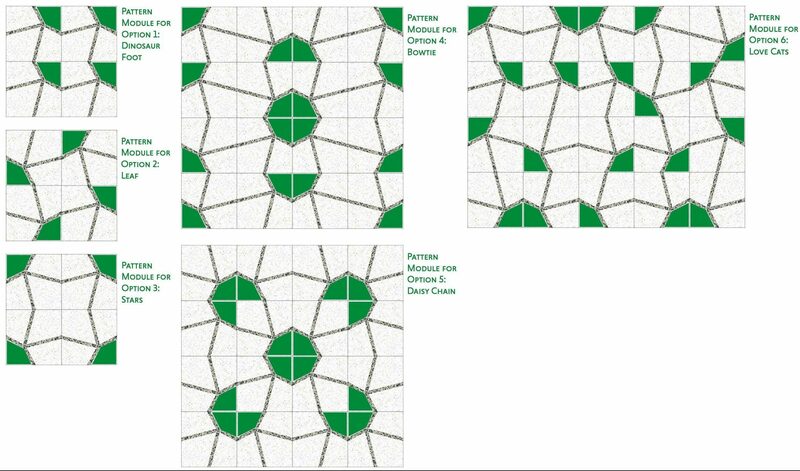 I’ve also illustrated the size of each pattern module that will repeat across the space and how each tile is orientated in that module with a green polygon in the corner. Please contact your Architectural Sales Consultant and Design Services for pattern design options for your next project. Our Director of Sales, Scott Bocketti, saw cat heads in Option 6 and coined it Love Cats, a song by The Cure.